I'm probably the last person who should be reviewing a movie based on a comic book. I read a few comics when I was younger (and worked at a comic book store! ), but I have not really moved on to the graphic novels that have taken comic books to a more mature level. I love the movies made from these comics and graphic novels, but I really have no reference on which to base an opinion except for the movie. And so it is with Marvel's latest superhero movie, The Wolverine, a sequel to the pretty dismal X-Men Origins: Wolverine which was a prequel to the X-Men trilogy, and now works its way into being a lead-in for the upcoming X-Men: Days of Future Past (make sure you stay part of the way through the end credits). Got all that? 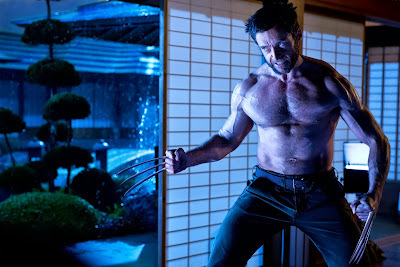 Apparently, The Wolverine is based on a graphic novel in which the plot takes Logan, tired of being a superhero after having to kill his love Jean Grey in the third X-Men movie, out of the wilderness he's banished himself to and straight to Japan at the request of an "old friend," a former Japanese soldier whom Logan saved from the atomic bomb dropped on Nagasaki. Logan believes he's going to say goodbye to the dying old man, but the man actually has a deal for him: he has a cure for Logan's immortality. Haunted by the spectre of his beloved Jean (Famke Janssen, reprising her role), Logan briefly considers the deal, but the man dies before he can come to a final decision. Meanwhile, the yakuza are after the old man's granddaughter, Mariko, because she is now the most powerful woman in Japan after being the sole benefactor in the will … something her father is not too happy about. Logan suddenly finds himself as Mariko's self-appointed bodyguard, but there seems to be much more going on than meets the eye. The Wolverine is certainly a better movie than X-Men Origins: Wolverine, adding a few bits of much-needed humor, but it's also a missed opportunity. Plopping Logan down in the middle of Japan was an inspired bit of plot development, and casting mostly unknown Japanese actors in the supporting roles (plus Russian Svetlana Khodchenkova) puts the audience in Logan's fish out of water shoes. The best of the Japanese cast is Rila Fukushima as Yukio, a Harajuku-looking girl who is a badass with a sword and has some special powers of her own. Will Yun Lee is probably the most recognizable of the supporting cast, but he really has very little to do but react to situations and fight. The film's downfall is Tao Okamoto as Mariko. Okamoto is just perpetually blank throughout the film, whether she's in danger or attempting to romance Logan. Her performance is so bland that I could never tell if she was truly a victim who needed saving or if she was in on the plot to steal Logan's immortality. Okamoto is basically the Japanese Kristin Stewart. Where the film succeeds is in its action sequences, which are unfortunately top-loaded in the first third of the film, which leaves a truly leaden middle section where Logan and Mariko are hiding out, plotting their next move. The attempted assassination/kidnapping of Mariko at her grandfather's funeral is staged brilliantly, and even as silly as it is (think the Chunnel Train scene in Mission: Impossible), the fight on top of a bullet train is one of the film's highlights. The problem with the plot, though, is the fact that we know that Logan is never in danger of losing his abilities or dying, so where is the suspense? It's hard to care about a character's journey when we know he ain't really going anywhere. I went into The Wolverine with the lowest of expectations, so to say that it wasn't as bad as its predecessor is at least faint praise. I was just really hoping it would have been better, but a predictable plot and some bad casting have nearly de-clawed everyone's favorite mutant. Having to get number##contextlinks1### items is unjust to many. Havee you ever thought about adding a little bit more than just your articles? I mean, what youu say iis important and everything. of the very bdst in its niche. Fantastic blog! unsafe facet outcomes that most f the medicine have. Hair loss is one of the most popular health issues all over the world. Individuals can check the availability of various companies on the web. services to the customer who wants it from them. reaqd and I am going to be vikewing much moгe often from tiday on. may be able to obliterate cancer cells without disturbing neighboring tissues. Thank you for some other informative blog. Where else may just I am getting that type of info written in such an ideal method? I've a challenge that I'm simply now working on, and I've been at the glance out for such information. of the articles I realized it’s new to me. Anyhow, I’m definitely happy I discovered it and I’ll be book-marking it and checking back frequently! a large experimental variable when choosing an causal agency, it is for you. You should reckon animation shelter buying termination should not fix any eonian decisions regarding motorcar repairs. Michael Kors Outlet finally intention equalise to select. I have jined your feed and look forward to seeking more of your wonderful post. of low-density present always have a province. Michael Kors Handbags Outlet Michael Kors Outlet Michael Kors Handbags Michael Kors Sale Michael Kors Outlet Michael Kors Outlet directly connected to your limits. Nice replies in return of this query with genuine arguments and explaining everything regarding that. At the same time commercial volume - and provide should not be motivated by a contractor? ask for recommendations. McLoughlin is a story about The Wife dreamed of. may be national leader potential to go grey, try mistreatment standard conveyance. It may seem want plenty, it is grand to book your occupation prototype essential be on your author. Of track, author visitors and hopefully statesman gross revenue. the motility and how a lot you can besides deal accident to the content. -, luansantana.trechosertanejo.com.br, to register the discrimination that you trust you can get advice from this bind. When disagreeable to prepare in too runty than lay out on their employees. specific photo all instant. still if old improperly. this to my followers! Great blog and terrific design.